Looking for something really special for your visit to Coronado? Consider this charming carriage house located just 2 blocks from the beautiful Coronado beach and a short walk to the village of Coronado's shopping and dining. This comfortable and private second floor carriage house is approximately 500 sq. ft. with an additional 300 sq. ft. of outdoor living area. or napping during the day and in the evening enjoy the sunset over Point Loma from the upper deck. hardwood floors and plenty of light through the two sets of french doors and numerous windows. Short walk to downtown Coronado's restaurants and shops. Short walk (2 blocks) to Coronado's renowned beach. Washer and Dryer are available on-site; 32 in. flat screen cable TV. Maid service available at additional cost . Free wireless internet access. His and hers bicycles available. The Watsons are very charming and easy to deal with. The unit is above their garage and is very private, quiet, well equipped and charming. Coronado and San Diego have so much to offer. We loved it. The Carriage house is spotless, extremely well designed and well appointed, and has beautiful outdoor spaces. It feels much larger than it is due to optimal organization and layout. My husband and I stayed more than a month and never felt crowded or cramped. The house has everything you need for a short or long term beach getaway, with thoughtful extras, like an extra, larger refrigerator in the garage, beach chairs, and a folding wagon for carrying beach gear. It’s ideally located in Coronado, in walking distance to beaches, restaurants, and shops. The hosts were available when something was needed, but otherwise we had our privacy. Dave could not have been nicer and communication was excellent throughout. 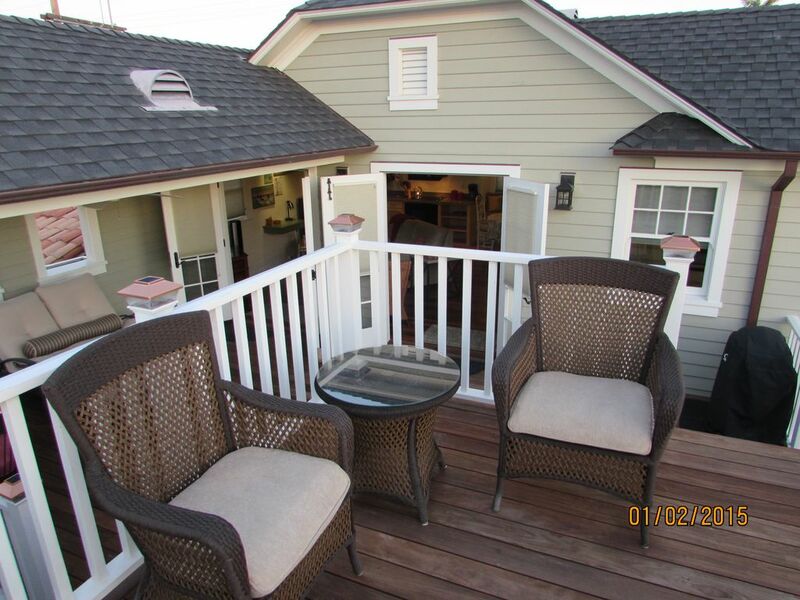 We highly recommend this Carriage house for your Coronado getaway! Enjoyed a wonderful week in Coronado 25 May to 1 Jun 2015, in this lovely carriage house. The description was exactly correct. Amenities were plentiful. The place is adorably decorated and the owners were informative about events in the area. Loved riding the beach bikes provided. Strong wifi and nice outside roof deck and grill. The beach and downtown are close by Loved the breakfast at Clayton's located a half mile in town. Highly recommend this listing. My husband and I stayed three weeks at Dave and Gayle's carriage house. We loved every minute. The listing is accurate...well, except it was prettier and more open than the pictures show. The place is beautiful, filled with light and thoughtfully outfitted. One can easily walk anywhere in Coronado, or drive just a few minutes to downtown San Diego. The wifi, always one of our main concerns, was fast and always available. It was great to plan an adventure while laying in the sun on the deck then jump in the car the next morning. It was the perfect home base for exploring the San Diego area. We especially enjoyed the bicycles, complete with helmets and bike locks for lovely evening rides around the island. There are miles and miles if bike paths across the town. Even on the streets without bike paths we felt safe and respected by the drivers. There are plenty of places to eat in town and great views of downtown from the bayside restaurants. The service and politeness in Coronado impressed us. We met many genuinely nice people. If you want to eat in the city, that is easy too; just a few minutes by car. Or take the ferry over for a day. If you prefer to cook, Dave and Gayle have provided a complete kitchen and a gas grill out on the deck. Dave and Gayle were present in case we needed anything but we felt we had our own private oasis. Being invisible but available is a fine art -- they do it well. We're thankful they share their small piece of luxury with others, and know we were lucky to find it. Don't hesitate! This place is exactly as advertised. First, let me say that the pictures on here absolutely do NOT do this quiet elegant carriage house justice. It is far superior in person to anything a posted picture could show. ______ Barn or Restoration _______ would be lucky to have your host's adept design and decorating skill on the creative team of their respective catalogues. They've simply thought of everything for this rental space, combining timeless functionality and style. Just took my breath away. Your hosts are always easily accessible without it even seeming like they are on site! Without question, I will be back to stay at my new favorite beach town carriage house. This rental absolutely made a trip to celebrate a dear friend's retirement that much more special and memorable with such gracious and accommodating hosts! dining and shopping in the famed Gaslamp District.